Some years ago I took photos of the Terry’s factory. The photos weren’t very good, and never got added to the site. 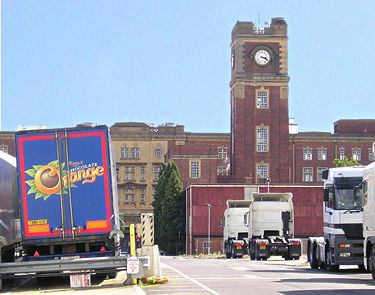 The one above was taken on 21 August 2004, when there were still lorries picking up from an active production line. I passed by again in 2007, when there were no longer lorries on the site. The building was still there, still is, awaiting redevelopment. On the locked gate of the disused factory, in 2007, were the developer’s signs advertising that this was just something else ‘acquired’. 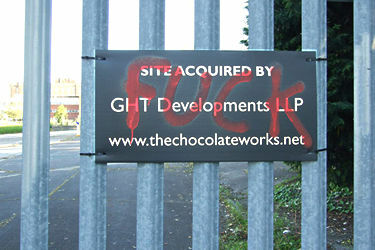 These signs are often smug and irritating, even if you didn’t have any personal connection to the premises ‘acquired’. There are certain words which are seen to be offensive. They are if they’re used without thought. Best saved for when you really need them. As in this case. This succinctly summed up what I’ve sometimes tried to articulate on these pages, more politely. Terry’s site, 29 March 2012 – demolition of some of the less architecturally significant buildings. Well done Lisa,that’s most appropriate on todays date,thats how I feel about my lost son David,but I have no Minster to remember in.Thank you. I hear site clearance has begun on removing some of the newer structures (and the asbestos etc), but of course the tower and the main factory building will be preserved. You’re right, it’s such a landmark building. I particularly like the view of it from the opposite side of the river, near Fulford, where there’s a gap in the trees on the riverbanks, and you see it over the river and Middlethorpe Ings.